Recently, I wrote a column which analyzed two seemingly contradictory conclusions: Donald Trump can’t win re-election, but the Democrats could still lose the 2020 presidential election. This column will attempt to lay out an approach enabling the Democrats to reduce any risk of Trump being re-elected. I am recommending four steps, which the Democrats can take to maximize their chances of defeating Trump next year. I will proffer this analysis without mentioning a single Democratic presidential candidate’s name, precisely because no matter who is nominated by the Democrats, to succeed their campaign will have to meet these four objectives. First, the Democratic ticket will have to simultaneously whelp the juggernaut of the Democratic base (e.g., minority, millennial, single women, labor households and highly educated voters), while at once shaving the margins among voters where Republicans hold the advantage (white men, retired veterans and White Catholic voters) and maximizing the Democrats’ opening with voters who tilted their way in 2018 (Independents, suburban women, Never-Trump Republicans and seniors). The political arithmetic of the current electorate reveals a probable Democratic turnout advantage of 4-8 percent over the Republicans (based more on the long term shrinkage of the Republican base since 2004 than on ephemeral enthusiasm gaps). Given Trump’s consolidation of bedrock GOP support, that means to win next year, the Democrats must master the following electoral equation: Democratic candidates must hold 90% plus of Democratic voters, while carrying Independents by doubt digits, to offset Trump’s tight hold on Republican loyalties in a general election (i.e., Trump is likely to carry at least 85% of Republican voters). Mastering this equation is essential for Democrats not just in the Electoral College, but also in the marginal congressional races. Second, and this is a painful fact which Democrats need to acknowledge: for five decades, conservatives have worked tirelessly and effectively to erode the public’s trust in the ability of liberal Democrats to govern capably. The problem for Democrats remains not the unpopularity of liberal ideas (in fact many liberal ideas from expanding health care coverage, to increasing the minimum wage, to less regressive tax policies, poll quite strongly with voters), instead it is the public’s lack of trust in the ability of liberals, who now call themselves progressives, to govern responsibly. The only true antidote to this trust deficit is a sustained period of effective governance by Democrats both in Washington and at the state and local level. Trump’s harping against political correctness and socialism is a talisman for the potency of this political reality. If Democrats are successfully portrayed by Trump’s Republicans as hostile to the free enterprise system, which employs the vast majority of voters and to faith, given that most Americans believe in God, it will be tough for Democrats to carry states in the heartland and the purpling states of the coastal South and the Mountain West, which Democrats need to win back the White House and to carry a majority in both houses of Congress. Democrats must simultaneously boost their base turnout and carry moderate voters to win a national election. Democrats will not win without achieving both goals, for two reasons rooted in hard electoral math. One, in terms of ideology, liberals are outvoted nationally by conservatives. While the ratio against liberals has been reduced (from the 40% who identified as conservatives to the 20% who identified as liberal and the 40% who self-identified as moderates in polling data from 1966-2006), it has not been eliminated (next year the national electorate will probably stand at 35% self identifying as conservatives, to 25% as liberals and 40% as moderate). The optical illusion is that liberals are now a clear majority in Democratic primaries, but liberal voters are nowhere near a majority of the electorate in general elections. The math is clear, liberals are a quarter of the electorate, Trump’s base is roughly a third of the electorate, victory will go to the side which dominates the center of November’s electorate, a center which all too often tends to be ignored in both party’s presidential primaries. The Democrat’s progressive wing often mischaracterizes this hard arithmetic which carries the force of gravity. Of course harnessing the energy of the newly awakened progressive pulse is essential to producing Democratic victories. But Democrats can’t win general elections unless they also learn how to open the ears of the nation’s illiberal majority. Too many progressives presume playing to the center of the electorate, can only mean serving mush to the electorate. The Democrats’ real goal should be creating a truly vital center of the electorate, where Democratic candidates present bold ideas on policy, which can also be protected politically (i.e., sustained by swing voters). Two, we live in an era where negative campaigning works. The campaign advantage that Republicans long have held, actually lies in the tactical advantage accruing to those attacking a major governing initiative. The best example lies in studying the politics of health care where the ACA did not become popular until the Republicans had to actually define Repeal and Replace (ending the advantage the GOP had in opposing Hillarycare in the 1990’s and Obamacare until the Trump administration tried to replace the ACA). The Times columnist, the economist Paul Krugman, makes a compelling political argument against the Democrats advancing a purity test on health care. Krugman reasons that the most shrewd Democratic goal for health care in 2020, would be advancing a pragmatic plan to achieve universal coverage in health care and putting off the debate on the single payer funding mechanism. The polling data is clear, public support for single payer health care falls sharply when voters learn that they must pay personally in taxes to compensate for the loss of employer provided health insurance. Third, this debate on health care exposes a tactical flaw in the progressive armor. Progressives are master diagnosticians of social ills and fervent champions of social justice. But as policy prescribers, their reflexes are all too often prone to promoting Rube Goldberg type policy proposals: complicated proposals which become easy victims to the negative campaign warfare that conservative Republicans in general and Trump in particular, are so proficient in exploiting. Add to this Rube Goldberg reflex, a penchant for tangents whereby progressive Democrats all too often leave themselves vulnerable to Republican counter attacks. The tragedy at Charlottesville should serve as a fire bell in the night warning Democratic candidates off falling for tangents. After Trump’s disastrous press conference, railing about good people on both sides, in the face of the vile and violent acts by Neo Nazi’s and white supremacists in Charlottesville, including the worst anti-Semitic rhetoric ever heard on the streets of America, several prominent Democrats lost their focus. Public opinion was probably locked in 90-10 against Trump shilling for Neo-Nazis and white supremacists, but several prominent Democrats promptly introduced taking down Confederate statues as the proper response to Charlottesville (at best a 55-45% issue in terms of public opinion). The net result was Trump was given a chance to dance off the ropes over Charlottesville, when he deflected the debate over toward Confederate statues. Democrats should have kept the focus for as long as possible on the plain and simple fact that most Americans saw with their own eyes that their President, Donald J. Trump was making excuses for Neo-Nazi’s and white supremacists. The question Democratic candidates need to start asking themselves is how they will respond to the progressive laundry list (e.g., packing the court, ending the Electoral College, abolishing ICE and reparations) when pressed on the campaign trail? I would suggest an analytical formula before candidates speak up in support of elements on that progressive wish list. Namely, how will support for these progressive issue planks affect two things: the ability to tangibly increase turnout from the Democratic base and how will it impact the party’s ability to carry the crucial swing blocs producing victory? Democratic candidates should be loath to lose their focus in the primaries, by getting diverted over issues that are not likely to produce those votes essential to victory in the general election. The stakes in the 2020 presidential election are serious and stark. Can Democrats really afford to indulge either their desire for purity on policy or reaching for tangents given those stakes? Or will Democrats find the political discipline to advance a purposeful campaign which can be defended politically in the general election? The lessons undergirding the political history in our nation, are worth studying before answering those questions. History teaches that “salience” and “sequencing” are a political necessity, not a luxury. Democrats should, campaign on those issues and themes that the voters care most about (salience) and when governing advance those ideas aggressively, but in an order which expands their political strength rather than reversing the partisan momentum (sequencing). It became fashionable last year, among the cognoscenti on both the left and right to pan the congressional Democrats messaging of a “Better Deal”, which segued into the “For the People” agenda. Meanwhile, that messaging passed the salience test, by advancing a program focusing upon the availability of affordable health care, jobs (infrastructure) and corruption free government, which scored decisive wins among voters in 2018. Fourth, there is an antidote to what threatens the Democrats, in the form of adopting the naval strategy of choke points as a tactical campaign weapon. Democrats should recognize that Trump as President, will bound around as if an Irish Setter who got into the cookie jar. Trump will continually chase the next shiny object or divert attention from mistakes by creating his own shiny objects. Let the media track Trump’s erratic sugar high approach to governing. Meanwhile, Democrats should avoid becoming bit players in that game, preferring to anticipate where the choke points will be in next year’s political seas (i.e., the places Trump will eventually have to come through), in order to establish a controlling position for Democratic candidates along those choke points. I see at least five choke points worth holding for Democrats: three macro and two micro. First and foremost on the macro front, with the yield curve for bonds inverting, the prospect of a recession by the Fall of 2020 looms. It would be morally wrong and politically stupid for Democrats to appear to root for a recession. But it would be smart for Democrats to continually advance the idea that we must take steps today to combat a potential recession looming on the horizon. Democrats should speak in favor of a robust infrastructure bill which passes in the House (this messaging has across the board appeal to the Democratic base and within each the four swing voting blocs). If the Republican Senate won’t pass that infrastructure bill, shame on them with the attending political blame to follow from voters. The second macro choke point, should be to advance a pragmatic plan for expanding the Affordable Care Act into a system of truly universal coverage (i.e., this speaks most clearly to minority voters, as well as senior and near senior Americans, with particular resonance among women of all ages). The shocking move by Trump’s Justice Department to argue in court in favor of striking down the Affordable Care Act, including ending protecting coverage for those with pre-existing conditions, could prove a political gift which keeps on giving. The third macro choke point is climate change, given the likelihood that before the voters head to the polls in November of 2020, we will go through two hurricane seasons and another Winter turning into Spring, capable of producing drought, fire and flooding. Public opinion in our nation is marching inexorably towards connecting the dots between climate change and adverse climate based events and storms (this issue speaks to the Democrats’ base, especially millennial voters and to suburban independents). I also smile at the ironic use of the term Green New Deal. No issue has a greater moral imperative than rolling back the ravages of climate change, which is an existential threat here in America and around the world. Meanwhile, which aspect of FDR’s New Deal will the green advocates adopt: the near certain political disaster of the early New Deal, the NIRA’s Blue Eagle (which the Supreme Court mercifully ruled unconstitutional), or the subsequent so called Little New Deal initiatives to combat the ravages of the Depression with accompanying constituencies providing pivotal political backing (e.g., around child labor laws, collective bargaining, Social Security, unemployment insurance, rural electrification)? Democrats would be wise to become calculating and disciplined on climate change: advancing cutting edge, yet realistic, policies combating climate change, so they are amassing, not repelling, the support of base and swing voters (i.e., the reason FDR’s New Deal ultimately realigned American politics). On the micro front, Democrats would be wise to establish a choke point around promoting vaccinations to prevent a public health crisis, given Trump’s open and longtime flirtation with the anti-vaccination movement. If a public health crisis afflicts a broad number of Americans (e.g., a measles outbreak), there will be hell to pay among America’s parents, especially its mothers. Democrats should build up their credibility on vaccinations before a public health crisis hits (this will unite urban and suburban mothers). The final choke point should be building in a concern that Trump is letting his bromance with Kim Jong-un enable North Korea to become more serious nuclear threat. If that threat mushrooms next year, there will be a political cost for Trump (given Trump’s chronically low public approval ratings on his stewardship of foreign policy). Democrats should become constructive but frequent critics of Trump’s bromance with Kim (a position that down the road could resonate with retired veterans, as well as conservative Democrats and moderate Independents). Democrats need not go for the kill on the front end of these choke points, because the rational for this tactic is establishing a reasoned and reasonable partisan advantage around an area of concern that is likely to become a very real concern for voters in 2020 (the economy, healthcare, climate change, public health and North Korea). The real trick to maximizing the value of controlling these choke points, lies in layered messaging repeated over and over again. If Trump sinks along any of these choke points, Democrats can always escalate their attacks to match the severity of Trump’s mistakes or adverse events. Nevertheless, the tactical goal remains enabling Democrats to control the political seas around each choke point, so that when Trump will be forced by events to pass through these choke points, Democratic candidates will have already defined both a proper policy and popular political approach (i.e., placing Trump on the defensive). Democrats should also be alert for events which in turn offer new choke point targets (e.g., if the purge at Homeland Security leads to chaos which lowers our defenses to successfully combat terrorism). There is a majority which can be rallied around the proposition that the Trump presidency represents a threat to the nation’s wellbeing. This threat extends to our economy, our nation’s standing in the world (including our ability to preserve the international order in what Richard Haass has correctly labelled a world in disarray) and constitutional norms, which have bound our nation together on a bi-partisan and cross ideological basis, from Jefferson and Hamilton on down through Reagan and Obama. If the Democrats rally more than their base and reach out for moderate independents and Never-Trump Republicans, a majority can be forged behind the view that eight years of Trump’s version of MAGA (Make America Great Again) will actually become MAD (it will Make America Decline, precipitously and unnecessarily). Based upon the hard arithmetic underlying American politics, Donald Trump should lose the 2020 presidential election. Yet, I sense with every fiber in my being that it will not only not be an easy victory for Democrats. In 2020, the Democrats are about to embark on the political equivalent of a journey following the Yellow Brick road. The question becomes whether it will be a road playing into the hands of Trump’s Wizard of Oz act, or whether it becomes a path towards proving that behind the curtain, President Trump has been a very bad wizard. 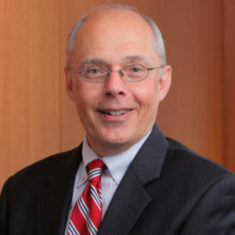 Bruce N. Gyory is a political and strategic consultant at Manatt, Phelps & Phillips LLP.